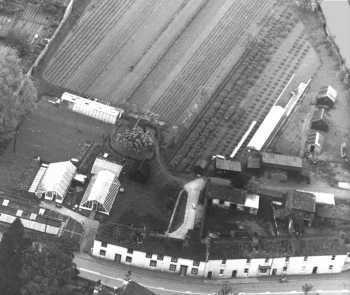 The following photo shows part of the present nursery site many years ago. The shadow of the church steeple in the foreground provides the clue to the exact positioning. The house at the rear is Garden House. The period is probably around 1900. If anyone is an expert at ageing costume I would be interested to know the date of the photo. 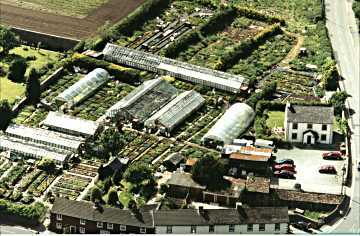 The nursery was originally a market garden and the same family business has existed here for almost 100 years. Originally soft fruit, vegetables, cut flowers and just a few plants were grown. Most of the produce from around 20 acres of land was sold in Carlisle market. Until around 1960 there was also a compliment of livestock including pigs, hens, cows and horses. 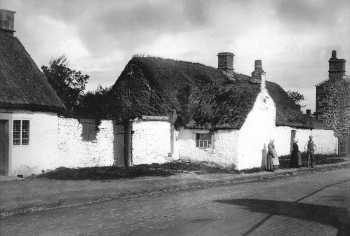 The following photo is in the early 1960s. In 1990 we began concentrating mainly on garden plants. During the next few years we stopped growing vegetables altogether and we also pulled out of Carlisle Market. The nursery is now around 2 acres. The following photo is an aerial view taken in June 2000.